If you asked me this morning which nation has the most mass shootings in the world, I would have said, with perhaps a flicker of hesitation, the United States. This is a tad embarrassing to admit because I’m pretty familiar with shooting statistics, having written several articles on gun violence and the Second Amendment. Below is a basic overview of gun violence in America. 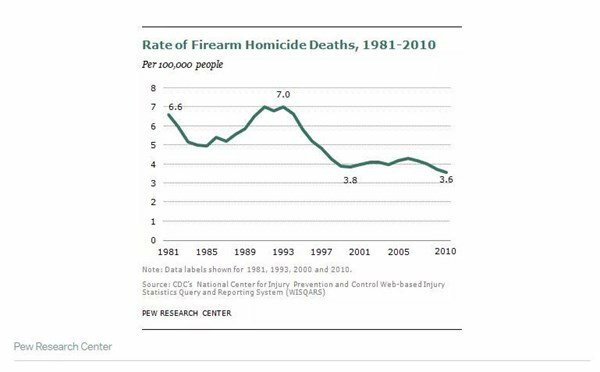 While gun homicides have been steadily declining for decades in the US, mass shootings have indeed been trending upward. This fact alone probably would not have led me to believe that the US leads the world in mass shootings, however. An assist goes to the US media and politicians. Media headlines have left little doubt that the US leads the world in mass shootings. In fact, according to CNN, it isn’t even close. It’s a slam dunk case except for one thing: it’s not true. Statistics on global mass shooting incidents from 2009 to 2015 compiled by economist John Lott of the Crime Prevention Research Center show that the US trails many other advanced nations in mass shooting frequency and death rate. If this is true, how did the narrative that the US leads the world in mass shootings become the conventional wisdom? The myth, it turns out, stems from University of Alabama associate professor Adam Lankford. Lankford’s name pops up in a montage of media reports which cite his research as evidence that America leads the world in mass shootings. The violence, Lankford said, stems from the high rate of gun ownership in America. Lankford’s findings show that there were 90 mass public shooters in America since 1966, the most in the world, which had a total of 202. But Lott, using Lankford’s definition of a mass shooting—“four or more people killed”—found more than 3,000 such shootings, John Stossel recently reported. When findings do not mesh, scholars, in pursuit of truth, generally compare notes, data, and methodology to find out how they reached their conclusions. After all, who is to say Lankford doesn’t have it right and Lott is wrong? There’s just one problem: Lankford isn’t talking. “That’s academic malpractice,” Lott tells Stossel. Indeed it is. Yet, it doesn’t explain how one professor’s research was so rapidly disseminated that its erroneous claim quickly became the conventional wisdom in a country with 330 million people. For that, we must look to the era of narrative-driven journalism and the politicization of society, both of which subjugate truth to ideology and politics. Media and politicians latched onto Lankford’s findings in droves because his findings were convenient, not because they were true. Twain’s quote remains true even in the age of the internet. Lankford’s erroneous research had free rein for two years and was disseminated to tens of millions of viewers and readers before the truth finally got its shoes on. 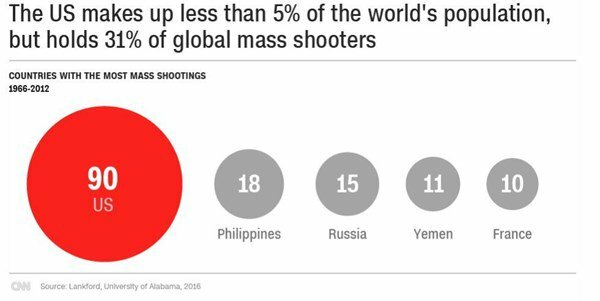 If you ask most Americans today which country leads the world in mass shootings, I suspect a vast majority would say the US. And there’s always a price for the erosion of truth. Red Flag laws have spurred quite a bit of controversy. 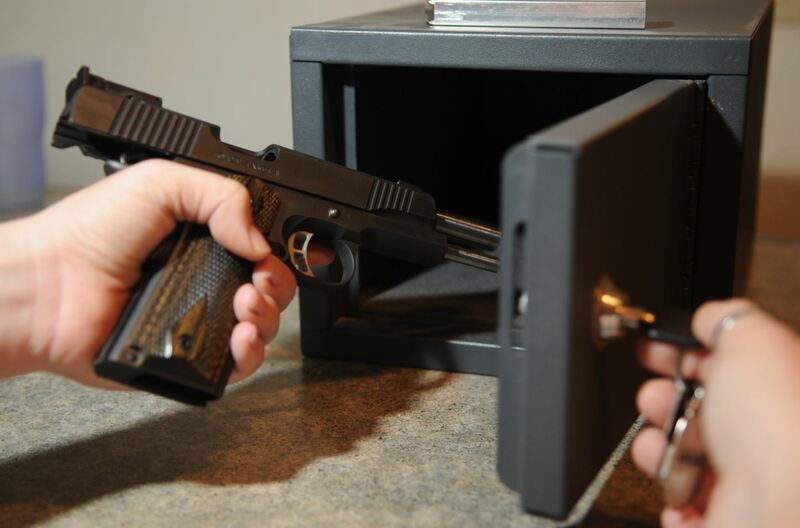 This legislative movement seeks to create a process to remove firearms from the homes of people who are rumored to be dangerous to themselves or others. The proponents of such laws cite this as a possible way to help combat mass shootings and suicides. However, the truth is far more damning. The 5th & 14th Amendments of the U.S. Constitution mandate that no one shall be “deprived of life, liberty or property without due process of law.” Although this should be clear to anyone with a basic comprehension of English, it’s often ignored by judges and politicians. Depriving people of a constitutional right before a trial and without charges tramples on the notion of innocent until proven guilty and severely erodes the core values of justice. Proponents of red flag laws argue due process is respected by allowing the deprived to appeal to the courts to reinstate their rights. However, this backward process would imply that the second amendment is a privilege, not a right. Furthermore, state agents finding cause for a warrant and subsequently seizing private property while denying access to a constitutional right seem to be a perfect setup for a kangaroo court system. There is a serious risk that citizens found guilty of nothing and charged with no crime will be paying expensive fees to petition the courts to restore what should be their constitutionally guaranteed rights. Such concerns aren’t just wild superstitions. Our nation’s history of the corrupt process of civil asset forfeiture gives ample reason to believe the aforementioned outcome is more likely than not. If the open assault on our rights and criminal justice system wasn’t reason enough to reject red flag laws, one should note the paternalistic tone of the advocates. Proponents are selling these bills as a way to reduce suicides. But let’s take a step back and think about the core of this argument. We have authority figures claiming they need the means to deny you of your constitutional rights in order to protect you from yourself. This disturbingly authoritarian doublespeak implies that some of our elected officials believe that people can’t be trusted with their rights. This clear attempt to coax ordinary citizens into surrendering their rights should be rejected as the degradation of free society that it is. Americans should also pay very close attention to states that have implemented these laws. In places like Maryland and Florida, success isn’t measured in lives saved. Intuitively, it’s impossible to determine how many lives were saved or if lives were ever truly at risk; thus the only practical measure of success for such a law is the number of guns seized and people denied their rights. Americans should resist the trend of assumed guilt and demand elected officials end this assault on our constitutional rights. This post Red Flag Laws: Life-Saving or Authoritarian? was originally published on Intellectual Takeout by Raheem Williams. From Parkland, Florida, to San Bernardino, California, the semi-automatic AR-15 rifle and its variants have seemingly become the weapons of choice for mass shooters in the United States. Many people simply cannot believe that regular civilians should be able to legally own so-called “weapons of war,” which they believe should only be in the hands of the military. According to Pew Research, for example, 81 percent of Democrats and even 50 percent of Republicans believe the federal government should ban “assault-style rifles” like the AR-15. Given the massive amount of carnage AR-15s and similar rifles have caused, it makes sense that the civilian population simply cannot be trusted to own such weapons, right? Perhaps, but is it really true that the AR-15, a popular firearm owned by millions of Americans, is a unique threat to public safety, so dangerous that it deserves to be banned or even confiscated by the federal government? It cannot be emphasized enough that any homicide is a tragedy, but in order to get a sense of how dangerous to public safety “assault-style” rifles are, it’s useful to compare their usage in homicide to other methods. The Center for Disease Control (CDC) and the Federal Bureau of Investigation(FBI) are the two authoritative sources for homicide statistics in the United States. According to the Bureau of Justice Statistics (BJS), the CDC reports “produce more accurate homicide trends at the national level” because they capture less under-reporting than the FBI statistics. 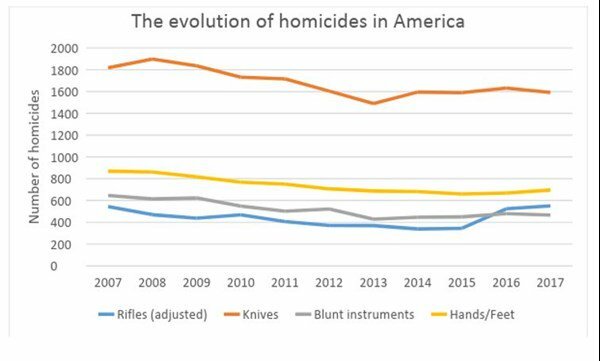 According to the BJS, the FBI data is “better suited for understanding the circumstances surrounding homicide incidents.” This is especially true given that the FBI, but not the CDC, records the type of firearm used in a given homicide. For the purposes of this analysis, the data from the FBI will be used. There are two further limitations of FBI data worth noting. Firstly, the FBI reports do not look at “assault-style” rifles specifically, but rather, murders involving all types of rifles, whether they are committed with an AR-15 or a hunting rifle. Secondly, each year there are a few thousand homicide cases where the type of firearm used goes unreported to the FBI. This means that some murders listed under “unknown firearm” may, in fact, be rifle murders. To account for this under-reporting, we will extrapolate from rifles’ share of firearm murders where the type of weapon is known in order to estimate the number of “unknown” firearms that were in actuality rifle homicides. How many murders involve rifles like the AR-15? 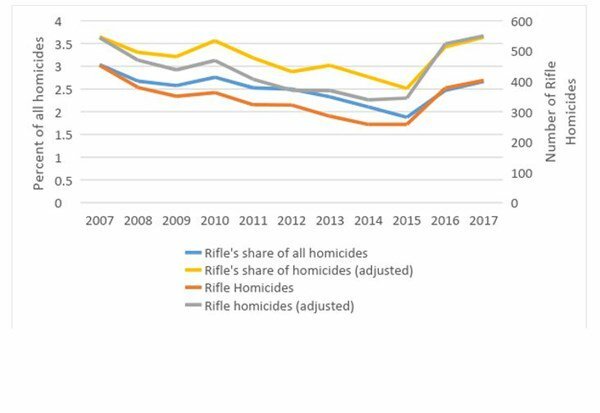 If we take the time to look at the raw data provided by the FBI, we find that all rifles, not just “assault-style rifles,” constitute on average 340 homicides per year from 2007 through 2017 (see Figure 1.). When we adjust these numbers to take under-reporting into account, that number rises to an average of 439 per year. Figure 2 compares rifle homicides to homicides with other non-firearm weapons. Believe it or not, between 2007 and 2017, nearly 1,700 people were murdered with a knife or sharp object per year. That’s almost four times the number of people murdered by an assailant with any sort of rifle. In any given year, for every person murdered with a rifle, there are 15 murdered with handguns, 1.7 with hands or fists, and 1.2 with blunt instruments. In fact, homicides with any sort of rifle represent a mere 3.2 percent of all homicides on average over the past decade. Given that the FBI statistics pertain to all rifles, the homicide frequency of “assault-style” rifles like the AR-15 is necessarily lesser still, as such firearms compose a fraction of all the rifles used in crime. That’s 173 over a span of a decade, with an average of 17 homicides per year. To put this in perspective, consider that at this rate it would take almost one-hundred years of mass shootings with AR-15s to produce the same number of homicide victims that knives and sharp objects produce in one year. With an average of 13,657 homicides per year during the 2007-2017 timeframe, about one-tenth of one percent of homicides were produced by mass shootings involving AR-15s. Mass shootings involving rifles like the AR-15 can produce dozens of victims at one time, and combined with extensive media coverage of these events, many people have been led to believe that such rifles pose a significant threat to public safety. However, such shootings are extremely rare, and a look at the FBI data informs us that homicide with these types of rifles represents an extremely small fraction of overall homicide violence. Banning or confiscating such firearms from the civilian population would likely produce little to no reduction in violent crime rates in America.